This is the first in a series of articles on the life of Korean War veteran Gordon EG Brown. Gordon Brown Discussing Korean War to Coalhurst High School Students – May 2017. 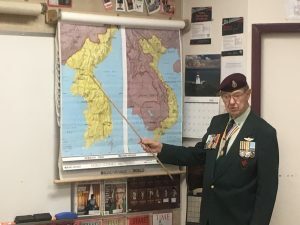 Each Spring, for the past 12 years at Coalhurst High School, Canadian Veteran Gordon Brown has spoken to Social Studies students about World War I, and the importance of that conflict in establishing the Canadian military identity. With a soft-spoken voice but commanding presence Gordon relates to the kids how the war catapulted Canada to become a major player on the world stage. Using the case study of his father-in-law, World War I veteran Arthur Baxter, who was gassed at Ypres in 1916 and lost his leg at Vimy Ridge in 1917, Gordon talks about the individual soldier’s sacrifice in Canadian military engagement since 1914, making his annual visits an important, if not popular, event in the school. 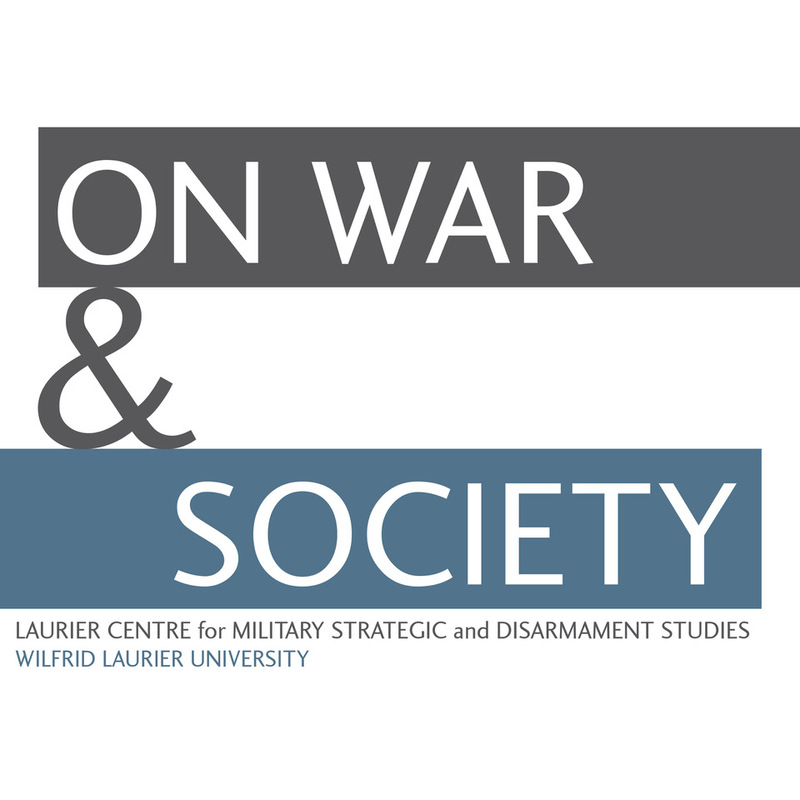 In front of 23 Grade 12 students at Coalhurst High School on March 23, 2017, however, Gordon altered the topic, albeit slightly, and instead focussed on a war that for 64 years he had talked very little of, and only then to a select few that had the trust, couth, and temerity to heed his tale; that is, his experience of the Korean War, in which Gordon served as a member of the 1st Battalion of Princess Patricias from 1951-1953. It is this personal commitment to remembrance that fuels Gordon, a pledge that has been a part of him since his return to Canada in 1953. In recent years it has taken on a more ardent need, as younger generations are further removed from war, and loose talk of ‘going to war,’ particularly in the tumultuous geopolitical world of the Korean peninsula today, is echoed in the news, on social media, in the public forum. There is danger in the unfettered proclamations that war is something that is limited, far removed, inconsequential, and can be easily wrapped up in a short period of time. Increasingly, in the minds of the young, perception of war, certainly total war, is limited to what may be covered in school textbooks, shown in popular movies, or displayed on first-person, simulated video games. 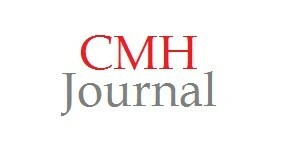 [iii] That is, in media that may be rich in hindsight, but woefully short on experience and perspective. 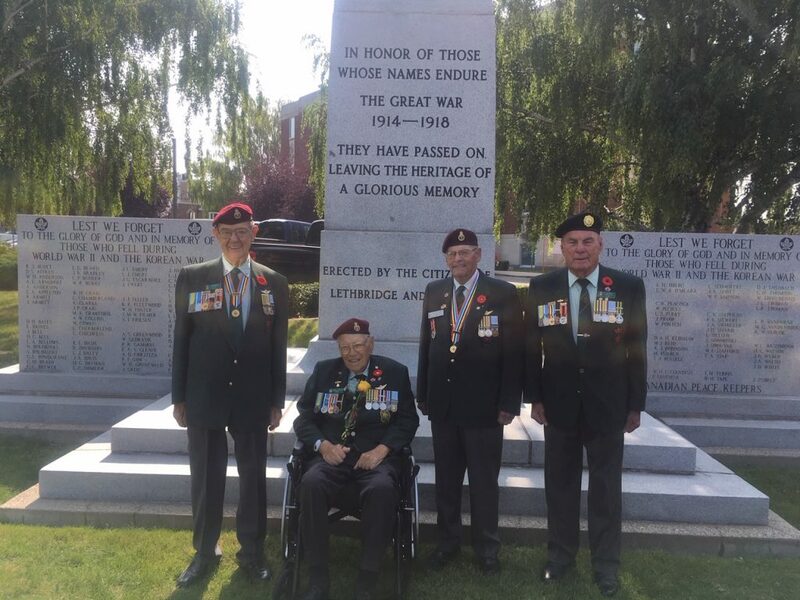 The four remaining Korean War veterans from Lethbridge at the Lethbridge Cenotaph. Pictured from left to right: Gordon Brown, Robert Bysouth, Clayton Stobbs and Jim Wright. Photo by the author. For Gordon, the decision to open up about Korea, along with his continuing resolution to ensure people understand the risks, the devastation, the sacrifice, and the abomination of war, is a cautionary intent. It is part of a life’s work to ensure the men he served with are never forgotten, and whose sacrifice have not been made in vain, but it is also part of a larger objective to ensure every generation that follows his own does not blunder into the tragedy of war based on emotion, arrogance, short-sightedness, or ill-conceived volition. This is the heart of Gordon’s message to the young, really to anyone who will listen. In many respects, it is what has helped Gordon himself cope with the more dispiriting memories of the war. John B. Brown – Gordon’s Grandfather. It is a story that Gordon today tells with merriment, for his paternal grandfather had a positive influence on Gordon’s life. 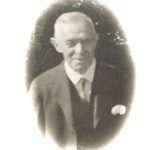 His grandfather was a hard worker who tended three Baptist churches in the London area, and strove to maintain a strong, mutual friendship with his daughter-in-law Evelyn. It was his dedicated service to the Freemasons that later compelled Gordon himself to join the order in 1998, of which he remains a proud Mason today. In his later elementary years, Gordon began to develop an interest in the Canadian military. Attending school in a red-brick, one-room elementary school in the country, Gordon was only one of two kids in his grade, and he had the same teacher from Grade 1 to 8. At the school, Gordon remembered reading war stories of heroic Canadians fighting in the Second World War against the Nazis in government-issued books that allowed kids to fill out messages of support to the Canadian soldiers. Gordon, like many Canadian children of the era, was immersed in the patriotic culture that encompassed the growing of Victory Gardens, the collection of war stamps, and everyone doing their part in food rationing. [v] Gordon also had a personal connection to the war. His first cousin, Allan Francis Brown, born and raised in Winnipeg, Manitoba, served as a Pilot Officer for the RCAF from 1943-1944. While on a mission to bomb Nazi controlled railway yards in Le Mans, France, his Halifax LV989 plane spiralled, crashed, and exploded in a field near Snape in North Yorkshire, England on May 23rd, 1944, killing four out of the five crew members, including Allan. [vi] He and his crew’s names are listed on the Memorial Wall at the Bomber Command Museum in Nanton, Alberta, which Gordon continues to visit every year. During his time at Beal Tech, a teenaged Gordon became fond of history, geography, and mechanics, and looked with great admiration upon the World War II veterans. His paternal side continued to revere the sacrifice of his cousin Allan. As an 18-year old graduate, it was time for Gordon to answer the call, this time in Korea. His actual knowledge of the conflict was relatively straightforward in terms of the principal cause of the fighting, the larger picture of Korea as a Cold War proxy war only came with time, experience, and the perspective of hindsight. Nevertheless, he felt compelled to volunteer at the time. After waiting patiently for the surviving Second World War veterans to answer the call, Gordon met the absolute minimum age for enlistment and signed up at the Wolseley Barracks calling station in London. By the fall, he was sent to Camp Borden in Simcoe County, Ontario for basic training. A vigorous, at times gruelling, foray of physical training and military drills, Gordon remembers the overall experience of training as a positive one. [viii] He made several friends during that time, and specifically requested to join the Princess Patricia’s regiment, a request he was ultimately granted. A part of the 1st Battalion of the Princess Patricia’s (1PPCLI), Gordon was not certain he would receive the call to go to Korea, but the possibility became a reality in June of 1951. Shipped off by train from Calgary to Seattle, Gordon and his fellow soldiers made one stop in British Columbia where the Salvation Army bade them greetings, along with serving them coffee, sandwiches, and cookies. Onboard the Liberty ship the General Gaffe, Gordon and his fellow soldiers spent three weeks on the Pacific Ocean, a ‘love-it, hate-it’ experience in which Gordon experienced beautiful sun-scapes along the Pacific horizon, but also had to wither through the turbulent weather that the Pacific’s rough storms would bring. Landing in Yokohama, Japan, the young men crossed the country by train, a peculiar memory for Gordon because the passenger cars had wooden seats with no padding, which made for a lot of standing. An older Japanese gentleman also caught Gordon’s eye on route, particularly the small, handheld orange he was eating that peeled quite easily without any mess. A common Christmas treat in Canada today, the fruit was a Mandarin orange, and it was the first time Gordon saw one. As they arrived at Pusan Harbour in South Korea, Gordon remembered being greeted by the American army band that welcomed all Canadian soldiers inbound to the country, who serenaded the troops with the song “If I Knew You Were Coming, I’d Have Baked You a Cake,” a memory Gordon still relates with a chuckle because the band played nothing else, and kept repeating the song over and over, ultimately grating the nerves of several soldiers at the time. [xi] Unfortunately, as it turned out, it would be the last fond memory Gordon would have in Korea for a very long time after that. [i] Kelly Dickerson, “Soldiers Returning Home Are Faced with a Heartbreaking Problem Most People Don’t Understand,” Business Insider, http://www.businessinsider.com/veterans-face-a-huge-problem-most-people-dont-understand-2015-11, Nov 11, 2015. [ii] Personal Interview with Mr. Gordon Brown, Feb 20, 2018. [iii] Sean Illing, “War in 140 Characters: How Social Media is Reshaping Conflict in the 21st Century,” Vox, https://www.vox.com/world/2017/12/8/16690352/social-media-war-facebook-twitter-russia, Dec 8, 2017. [iv] Personal Interview with Mr. Gordon Brown, Nov 4, 2017. 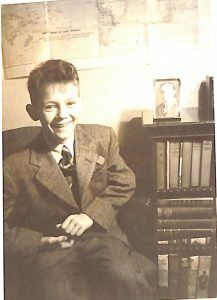 [v] Tim Cook, “Canadian Children and the Second World War,” Historica Canada, http://www.thecanadianencyclopedia.ca/en/article/canadian-children-and-wwii/, April 12, 2016. [vii] Personal Interview with Mr. Gordon Brown, Feb 20, 2018. [ix] Jung Chiang & Jon Halliday, Mao: The Unknown Story, Anchor Books, Globalfair Ltd., 2005, pgs. 359-361. [x] David McCullough, Truman, Touchstone Books (Simon & Schuster, 1992), pgs. 845-847. See also: Truman, Harry, as quoted in The Ottawa Journal, April 12, 1951 in Ted Barris, Deadlock in Korea: Canadians at War, 1950-1953 (MacMillan Canada, 1999), pg. 91. [xi] Personal Interview with Mr. Gordon Brown, Nov 4th, 2017. See also: Brent Byron Watson, Far Eastern Tour: The Canadian Infantry in Korea, 1950-1953 (McGill Queen’s University Press, 2002), pg. 52. Excellent,really enjoyed this. Look forward to reading more. Great job Michael!